Innovative technology for automated video reporting and forensic video post processing. While processing of video files, the forensic experts constantly faced with the problem to enable a flexible and efficient fast functional evaluation. In the examination of video files, it is necessary to bring it in any visible form and on paper. This is made possible only by obtaining screenshoots of individual video frames. Forensic Video Report was developed for this purpose. It is to give the forensic expert a video report tool in his hand, with which he can create a usable video preview quickly and without much time. Forensic Video Report provides the ability to create a PDF report file with a video overview or to generate a short three images preview for use in any standard software that can then be processed and printed. 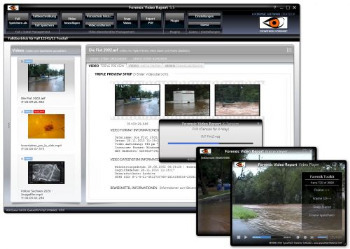 The video engine of the Forensic Video Report has been completely redeveloped. Standard video codecs in addition no longer required, they are all included. The advantage of using the automatic features of the Forensic Video Report is primarily the time saved factor. It is no longer necessary to use human resource in order to view videos in real time. But also another advantage is obvious. The psychological burden of agents in procedure with images of children in sexual activity can be reduced, since a review of the mentally strong incriminating videos no longer needs to be done in real time but on the video overview of the evidence object a final classification can be done already. With the expansions of the Forensic Video Report with plugins important new features have been added in the field of forensic manual processing of video recordings of surveillance cameras and mobile phones. With the help of plugins it is possible to work up video material quality with appropriate algorithms to obtain subsequently latent video information, which is not visible in the pure still image. This already known technique adopted from the famous forensic TV series are, at least to some extent also applicable in the real daily life of a forensic expert and can improve video representations of apparently poor base.